If you've switched from white rice to brown rice to up the nutrition in your diet, you made a good choice. But if you're looking to improve the nutritional quality of your diet even more, consider adding black rice to your whole-grain rotation. While both brown rice and black rice are low in fat and a good source of healthy carbs, black rice is lower in calories and a better source of fiber. It might be a better source of antioxidants, too. If you like rice and you're counting calories, black rice makes a better choice when compared to brown rice. A 1/3-cup serving of dry black rice contains 200 calories, while the same serving of brown rice contains 226 calories. Twenty-six calories may not seem like much of a difference, but consuming an extra 26 calories a day over one year can lead to a 2.7-pound weight gain. Black rice is lower in carbs but higher in fiber, and a better source of protein than brown rice. A 1/3 cup serving of dry black rice contains 43 grams of carbs, 3 grams of fiber, 6 grams of protein and 2 grams of fat, while the same serving of brown rice contains 47 grams of carbs, 2 grams of fiber, 5 grams of protein and 2 grams of fat. The mineral content in both black and brown rice is very similar. A serving of either rice meets 8 percent of the daily value for zinc and 20 percent of the daily value for phosphorus. But the black rice is a slightly better source of iron, meeting 6 percent of the daily value, compared to 5 percent of the daily value in a serving of brown rice. Zinc is a mineral that supports immune health, phosphorus is needed for the formation of teeth and bones and iron helps transport oxygen throughout your body. A major difference between the black rice and brown rice is color, and the color of the black rice may also make it a better source of antioxidants, according to the American Chemical Society. Anthocyanin, a pigment found in the rice grain that creates its dark hue, is an antioxidant that may aid in your fight against heart disease and cancer. The American Chemical Society says that a spoonful of black rice bran has more antioxidant power than a spoonful of blueberries. 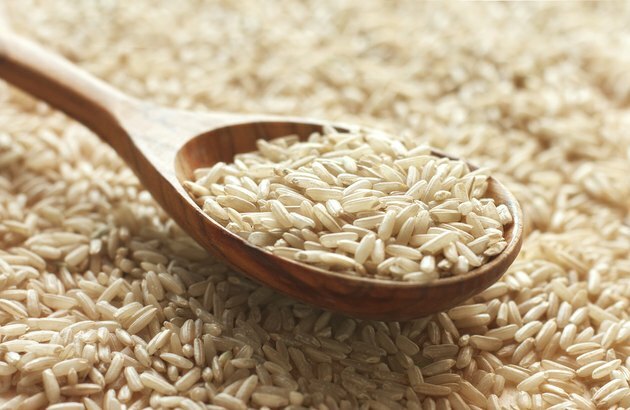 While brown rice is not a good source of anthocyanin, it is a source of vitamin E, which is also an important antioxidant that might offer protection against chronic illness.